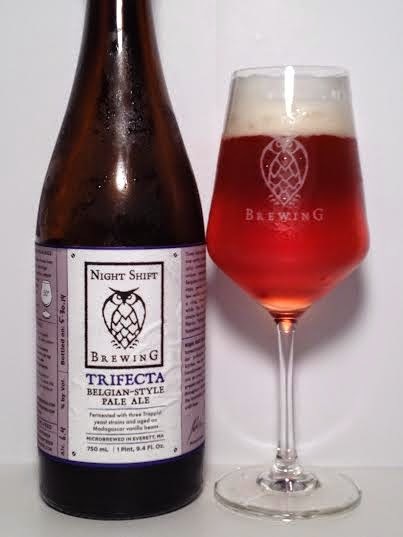 Night Shift Trifecta is a Belgian Pale Ale brewed with three different Trappist yeast strains and then aged on Madagascar vanilla beans. Pours to a dark orange with two fingers of white head which leaves plenty of lacing. I was taken aback by how sweet this beer smelled. I get the classic Belgian yeast with hints of banana and in the back those vanilla beans smack you in the face. Also in the mix is quite a large hop presence. Crazy, but this reminds me a lot of a cream soda with it's intense vanilla. The taste follows the nose rather well. Big vanilla up front and typical breadiness you get from Belgian yeast is there too. Sorry to sound like a broken record, but this is unexpectedly sweet. In addition to vanilla, the banana is very present. Maybe even a faint caramel on the finish. For as sweet as it is you'd expect it to be heavy or even syrupy, but it's not. Some decent carbonation makes this taste more like that cream soda I mentioned earlier. Surprisingly the finish shows no sign of bitterness as this is just sweet from front to back. It's not cloying at all and your taste buds are begging for another sip. I am pleasantly surprised by this offering from Night Shift. I didn't expect the vanilla to be so prominent, but it's not shy and it works well with the Trappist yeast. The flavors make for a carbonated vanilla/banana bomb with hints of hops and breadiness. Well done, Night Shift. Well done.